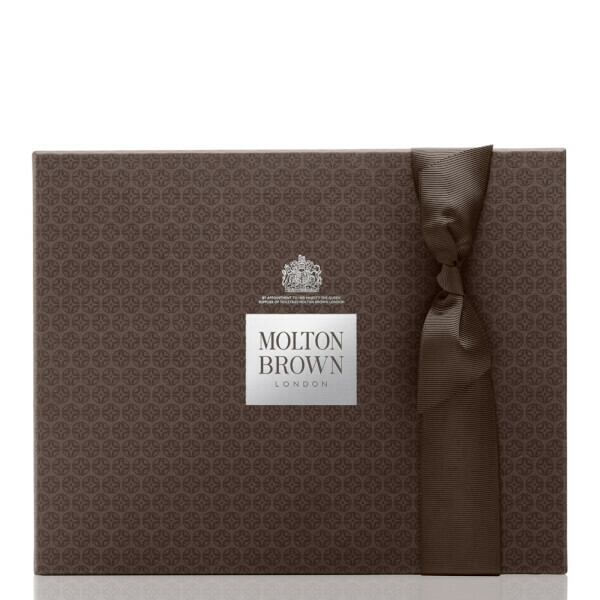 Treat your skin and senses to a collection of irresistible aromas with the Opulent Rituals Hand & Body Gift Set from Molton Brown. Combines three pampering favourites filled with floral, fruity and spicy scents. Creating a luxurious lather upon contact with water, the body wash utilises Italian Rose Oil to nourish and cleanse from top to toe. Inspired by mysterious paintings of Lombardia's Late Renaissance period, its voluptuous fragrance blends captivating notes of Blackcurrant, Geranium and rich Patchouli. A luxurious formula that takes inspiration from the iconic ‘Rhubarb Triangle’ in Yorkshire. Expertly blended with notes of sweet Rose, zesty Yuzu Fruit and bitter Rhubarb, the lightweight liquid gently cleans and softens hands, whilst imparting a delicate, harmonising fragrance of sugar-coated patisserie delicacies. A quick-absorbing hand cream that works to hydrate and care for wanting skin. Enriched with extracts of White Truffle Oil to intensely moisturise, the rich cream melts effortlessly into skin and leaves hands feeling soft, supple and luxuriously scented with a spicy fragrance of Pink Pepper, Ginger and Patchouli. Bath & Shower Gel: Rub a small amount into skin, work into a lather and then rinse off thoroughly. Hand Wash: Apply to damp skin, massage, then rinse. Hand Cream: Massage into clean, dry hands until absorbed.